A communication subsystem is a complex piece of Hardware and software. Early attempts for implementing the software for such subsystems were based on a single, complex, unstructured program with many interacting components. The resultant software was very difficult to test and modify. To overcome such problem, the ISO has developed a layered approach. In a layered approach, networking concept is divided into several layers, and each layer is assigned a particular task. Therefore, we can say that networking tasks depend upon the layers. The main aim of the layered architecture is to divide the design into small pieces. Each lower layer adds its services to the higher layer to provide a full set of services to manage communications and run the applications. It provides modularity and clear interfaces, i.e., provides interaction between subsystems. It ensures the independence between layers by providing the services from lower to higher layer without defining how the services are implemented. Therefore, any modification in a layer will not affect the other layers. The number of layers, functions, contents of each layer will vary from network to network. However, the purpose of each layer is to provide the service from lower to a higher layer and hiding the details from the layers of how the services are implemented. The basic elements of layered architecture are services, protocols, and interfaces. Service: It is a set of actions that a layer provides to the higher layer. 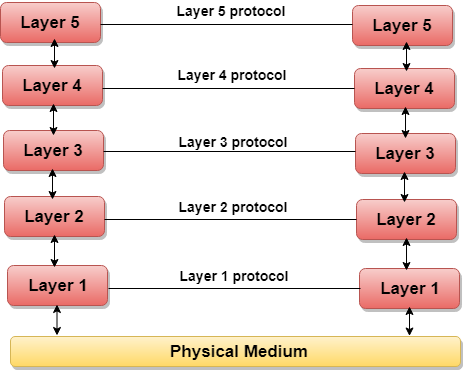 Protocol: It defines a set of rules that a layer uses to exchange the information with peer entity. These rules mainly concern about both the contents and order of the messages used. Interface: It is a way through which the message is transferred from one layer to another layer. In a layer n architecture, layer n on one machine will have a communication with the layer n on another machine and the rules used in a conversation are known as a layer-n protocol. Let's take an example of the five-layered architecture. In case of layered architecture, no data is transferred from layer n of one machine to layer n of another machine. Instead, each layer passes the data to the layer immediately just below it, until the lowest layer is reached. Below layer 1 is the physical medium through which the actual communication takes place. In a layered architecture, unmanageable tasks are divided into several small and manageable tasks. The data is passed from the upper layer to lower layer through an interface. A Layered architecture provides a clean-cut interface so that minimum information is shared among different layers. It also ensures that the implementation of one layer can be easily replaced by another implementation. A set of layers and protocols is known as network architecture. Why do we require Layered architecture? Divide-and-conquer approach: Divide-and-conquer approach makes a design process in such a way that the unmanageable tasks are divided into small and manageable tasks. In short, we can say that this approach reduces the complexity of the design. Modularity: Layered architecture is more modular. Modularity provides the independence of layers, which is easier to understand and implement. Easy to modify: It ensures the independence of layers so that implementation in one layer can be changed without affecting other layers. Easy to test: Each layer of the layered architecture can be analyzed and tested individually.